It’s important to be bold. It’s important to emphasize your words. But it’s more important to not emphasize all of them! If you do, then you’ve done nothing but make them less important than they were. Using bold, italics, quotation marks, parenthesis, ellipses and other punctuation or affectations are all interesting ways to set off important information. In fact, using them can be beneficial to your search engine results. Italics – Italics are used for emphasis, but search engines also look for italicized words, so place important, searchable phrases or book titles (for example) in italics. Bold – Making a word or phrase bold also signifies to search engines that it is important. Bold shows-off your main points or your big idea. 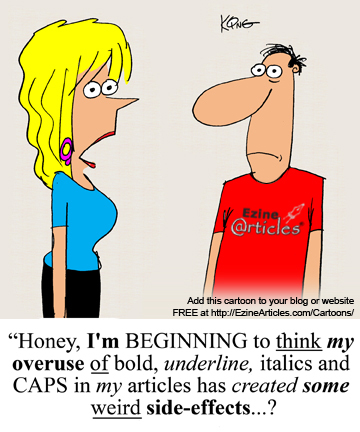 Use bold or italics to offset a new paragraph or introduce a new idea. However, if you make an entire paragraph bold, you run the risk of not only losing your reader – but losing your search engine ranking too. You don’t want to nullify everything you have written by making everything important. Of course all of what you have to say is important, but let’s face it, some of it is a little more important! Yes, how you are viewed by a search engine is very important, but your readers are more important – they are, after all, the people who click on your links – or your ads – buy your products and services and link back to you. Put the readers’ comfort first and you’ll be successful. It’s okay, even advisable, to incorporate emphasis into your articles. Just remember to keep it simple. And if you’re going to use bold or italics, be sure to be consistent throughout your article and emphasize words that are also in your title or meta descriptions. This will help Google and other search engines see the trees in the forest, as it were. Do you have other ways to make your articles easier to read and understand? Leave a comment and let us know about them! Bold and beautiful are the virtues very rarely fiund in human beings, but they can reflect it in their articles to a great extent. Totally in agreement with Marc. Too much of a good thing will always spoil the effect. The use of bold, underline or italics seeks to make something stand out from the rest, and if almost everything is somehow highlighted, the end result is that nothing stands out at all. Using bold emphasis is a type of persuasion that gently pulls the reader’s eyes to what is important. Although all the words are read, only the emphasized ones are remembered and acted upon. In my company emails the emphasis is stengthened by only highlighting the salient words and concepts. Glad to discover that search engines reward those that use persuasion tools. Victory goes to the bold! Yes less can be more. But as far as I can tell, most writers under-utilize rather than over-utilize the bolds, caps and italics. They’re just not bold enough (oh yes I did). Cute comic! Chuckled out loud. Thank you so much for such a great read. Love your article.